This is Part Two of my LDSFAQ Facetious Corner. This is my chance to tackle some silly questions or to offer silly answers to serious questions (depending on the whims of my mood). If you are offended, irritated, and outraged, why not submit your own questions to me and see what happens? Hey, sometimes I try. This is part of the LDSFAQ (Mormon Answers) suite by Jeff Lindsay, my unofficial if not completely misguided attempt to deal with questions about The Church of Jesus Christ of Latter-day Saints. Sometimes the questions I get from critics of Latter-day Saints are downright silly. Other times the question is good but I'm not quite serious. In either case, the result is fodder for the Facetious Corner. In addition to some light-hearted responses, there are several serious topics explored on this page, including the issue of mental health. Warning: Shockingly, a few of the answers on this "facetious questions" page are dangerously flippant. To those who are comically impaired or just feeling grouchy, reading this page will only make things worse. Avoid mental and spiritual injury by reading something more wholesome, such as Mormonism: The Dark Power Behind Windows XP, published by Kingdom of the Kults and now available on the awesome CultMaster 2000 CD. One of the best sources on the complex topic of Mormon polygamy is "Everything You Always Wanted to Know About Plural Marriage* (*but were afraid to ask)" by Greg Smith. He treats many aspects of this complex issue, including polyandry and young wives. If you want to deal directly with the most troubling allegations about this most difficult aspect of Joseph Smith and early Mormonism, then you need to read "Joseph Smith's Sexual Polyandry and the Emperor's New Clothes: On Closer Inspection, What Do We Find?" by Brian C. Hales. Mormanity is my LDS blog, in operation since 2004. Numerous issues have been discussed there. Join the fray! Or visit the other blogs on my blogroll there. On the issue of polygamy, for example, see my Mormanity post, "Single Men: Let's Keep Polygamy Forbidden and Illegal." Hey, you Mormon - just why do you think you're so smart? Do you really believe that a loving God exists and answers prayers? Did Joseph Smith say that people lived on the moon? Do Mormons have unusual Sabbath practices, like a 3-day Sabbath? Why is Utah so heavily medicated with antidepressants? How dare the Mormon Church spend money to make a shopping mall?! A mall, really? What do you think about the film, "The God Makers"? Do Mormons really pray after each touchdown that BYU makes? Are you a member of the Mormon hate cult? Hasn't Will Bagley proved that Brigham Young was a murderer? Why do Mormons try to get answers for every question? Isn't that the opposite of faith? Isn't that what cults do? How can you accept the many deaths that God has caused, according to your scriptures? If Mormons oppose gambling, why does the Church own most of Las Vegas? You fit the definition of a cult. Why deny it? Do Mormon temples resemble Wiccan rites? Aren't temples occult centers? Couldn't Satan have inspired Joseph to add all those impressive evidences to the Book of Mormon? Why does the Salt Lake Temple have five-pointed stars on it? Aren't they Satanic symbols? Why didn't you answer all my questions?? Failure to respond means your church is false!! Isn't tradition and Mormon culture all that holds people in the Church? Why are we instructed to keep a journal if the second coming is going to burn everything? How can we have free agency if God knows the future? I know a lady who stared into the sun and said she saw God. Lots of lunatics claim they see angels. What makes Joseph Smith any more believable? Isn't your whole Web site rather biased? Since all your answers are so predictable, doesn't that make you a crackpot Mormon apologist? Why do you Mormons have such a persecution complex? Is everyone who disagrees with you an "anti-Mormon" villain? Rejecting the ridiculous but still popular "look-say" method of reading taught in the schools (now refurbished as "whole language"), she used phonics instead to get me reading well and loving it at an early age. She didn't force me to play soccer, thus sparing my brain from repeated neurological damage from batting my head against a ball. I won't say that I'm any smarter than any other normal person of similar intelligence, but to the extent that I love to read and still have a partially functioning brain, I owe it all to my mother. Did I mention that Latter-day Saints tend to put an emphasis on education? LDS scriptures teach that part of our reason for being here is to grow and learn, and that we should be diligent in how we use our time. Continuous improvement, development of new skills, and life-long education ought to be a part of every Latter-day Saint's life. What we learn and experience in this mortal existence will be of value to us in the world to come. Based on my education in science and engineering, how I look forward to learning about the science and engineering involved in the Creation! My secular learning has greatly enhanced my joy and wonder in beholding the miracles of God's creations. How can anyone think about the detailed workings of white blood cells, or contemplate the marvelous structure and flavor of a strawberry, without seeing the hand of God? Every aspect of life and the cosmos seems to boldly bear the stamp "Designed by God" - but that stamp is only seen by those who will open their eyes. Do you really believe that a loving God exists and answers your prayers? Isn't that just a delusion? I know that God is real, that He loves us, and that He definitely answers prayers. It is largely through prayer that I know He exists and that the Gospel of Jesus Christ is true. I have experienced obvious and wonderful answers to many prayers (though many times the answer is an undesired "No" or a frustrating "Do your best" or an unnerving "So what did you expect?"). Prayer is the most important single component of LDS worship. Going to Church does not save a soul. Sitting through hours of meetings doesn't change our life or help us to know God if we are not worshipping Him personally and seeking Him through prayer. A Latter-day Saint who is not praying daily - and having meaningful prayer - is missing the point of our religion: to know God the Eternal Father and His Son Jesus Christ, Whom He has sent. It is through prayer - personal communication with God - that we can learn His will, understand His nature better, and receive guidance in our lives. I'd like to share a recent experience with you that points to the kindness of God and perhaps His desire for us to appreciate the wonders of His artwork in nature. I just got back from a wonderful vacation in the western United States (mostly southern Utah), where the wonders of God's creation can overwhelm the observer. (The majesty of one location - Cedar Breaks National Monument - literally brought my wife to tears.) A geologist and relative of mine, Paul Crosby, had taken us on a brief tour around the St. George area, explaining some of the processes that had created such strange beauty. A few days later, my three-year old son and I were walking along a deserted trail (once a road) on Butler Hill, right next to the Wasatch Mountains by Salt Lake City. I was surprised at the huge variety of rocks I was finding - igneous, metamorphic, sedimentary, in many colors and shapes. I paused and examined the setting and the beautiful mountains and wondered how such variety was possible on that former shore of Lake Bonneville. As I looked over the valley and recalled the inspiring morning with a geologist a few days earlier, I wished that I could talk to a geologist again to better appreciate that part of God's creation. My son and I then returned to picking through the many rock piles, looking for treasures of beauty. Just moments later, a man and his dog strolled by on that isolated lane. He interrupted us, saying, "I noticed that you are looking at the rocks here." Before I could say anything, he began to explain why there was such a variety of rocks to be found. The road that once went up this hill had been closed off by dumping random truckloads of rocks from around the state of Utah -- whatever rocks Salt Lake County happened to have it its trucks. As a result, there were varieties of lava rock from southern Utah, rocks from the Oquirrh mountain range, granites from Alta Canyon, metamorphic rocks from elsewhere in the Salt Lake area, and even some loads containing Indian artifacts. I was impressed and asked him how he was so well informed. "I'm a geologist for the State of Utah and have studied this area." Thrilled, I bombarded him with a number of other questions before he had to go, thus learning the identities of many of the rocks that had stirred my curiosity. It was a true treat for me - and a marvelous blessing. The Lord may seem to ignore most of our foolish pleas and may choose to let us suffer pain and disappointment for our own good, somehow, but through it all His loving kindness shows in marvelous ways. That gentle but flagrant act of kindness -- sending a geologist to visit me on an isolated stretch of long-closed road -- shows me something about the loving Parent we worship. Not only is He kind, but He wants us to know about His works and appreciate them - even to the point of sending a geologist our way at just the right time. God is real. His works and rocks are real. His Son, the Rock, is real. Seek Him in prayer! Nearly 5 decades after Joseph's death, the journal of Oliver Huntington reports that he heard Joseph say something of this nature while Oliver was a child. There is little reason to take Oliver's statement at face value. There is no other evidence that Joseph believed such a thing. But even if Joseph did accept some of the common misconceptions of his day (even some scientists speculated about the moon being inhabited), that provides no reason to reject him as a prophet. Prophets don't automatically become experts on all aspects of science. Even Moses had some basic scientific problems in classifying animals that appear as "errors" in the Bible (listing a bat as a "bird" and a hare as a cud chewer in Deut 14:7,18), but to those who get bent out of shape over that, I say "Get a life!" Women and Depression: The incidence of depression among LDS women is "nearly the same, if not lower than, for non-LDS women." A news article to the contrary was based on speculation from a friend of the reporter. Other such reports have been equally unfounded. Youth and Suicide: Research data consistently shows that religious belief and behavior are negatively related to suicide, resulting in decreased suicide attempts. Articles pointing out high suicide rates in Utah fail to mention that this is a regional phenomenon. "The Mountain West leads the nation with a rate of 18.6 per 100,000. Utah has the lowest rate in the Mountain region with 14.8 per 100,000." Divorce. People without religious affiliation have high divorce rates: 39% for men and 45% for women (divorced at least once). "Mormons have the lowest percentage ever divorced with values of 14 for men and 19 for women." Divorce rates plummet for those married in the Temple, with 5.4% for men and 6.5% for women. I am indebted to Mark D. Ellison for the information above. Previous studies have used population data to demonstrate an inverse association between suicide rates and religious commitment. This report examines Utah suicide rates for young men aged 15-34 years, stratified by their membership in and commitment to the Church of Jesus Christ of Latter-day Saints (LDS), the predominant religion in Utah. All state death records for males from 1991 to 1995 were obtained and linked to LDS church deceased membership records to obtain a measure of religious commitment that is not self-reported. Religious commitment for LDS church members was determined by age-appropriate priesthood office. Of the 27,738 male deaths reported, 15,555 (56%) linked to an LDS church record using a probabilistic linking program. Using active (high religious commitment) LDS as the reference group, the less-active (low religious commitment) LDS group had relative risks of suicide ranging from 3.28 (ages 15-19 years) to 7.64 (ages 25-29 years); nonmembers of the LDS church had relative risks ranging from 3.43 (ages 15-19 years) to 6.27 (ages 20-24 years). Although the mechanism of the association is unclear, higher levels of religiosity appear to be inversely associated with suicide. 71 percent of the outcomes indicated a positive relationship between religiosity and mental health variables, 4 percent negative, and 24 percent neutral (1 percent was curvilinear). While much of the anecdotal writing concerning the mental health of the Latter-day Saints has been negative, . . . . the majority of the research (95 percent of the outcomes) clearly refutes these negative assertions. The research evidence clearly indicates that Latter-day Saints who live their religion report better mental health than those who are less committed to the faith. The Center for Disease Control has an online article dealing with the regional variation in suicide entitled Regional Variations in Suicide Rates -- United States, 1990-1994 (also see their more recent statistics on suicide). Again, the West has a high rate, but Utah has a lower rate than the states surrounding it. The Utah rate in this article is listed at 15.0 per 100,000, compared to 20 for Wyoming, 18.4 for New Mexico, 18.0 for Arizona, 17.1 for Idaho, and a high-rollin' 24.1 for Nevada. I don't know why the West has such tribulations in its population, but Utah is not the epicenter of Western suicidal tremors. "Aside from the quickie-divorce mecca of Nevada, no region of the United States has a higher divorce rate than the Bible Belt. Tennessee, Arkansas, Alabama and Oklahoma round out the Top Five in frequency of divorce. In a country where nearly half of all marriages break up, the divorce rates in these conservative states are roughly 50 percent above the national average." The article noted that religious activity played some role, though it was unclear how. Compared to Catholic parts of the country where divorce is lower, "Bible Belt states, in contrast, are dominated by fundamentalist Protestant denominations that proclaim the sanctity of marriage but generally do not want to estrange churchgoers who do divorce." Well, it won't do to blame evangelical Protestantism on the social ills of the Bible belt, where many factors besides religion affect marriages. But since the most outspoken and nastiest anti-Mormons are typically evangelical Protestants (in contrast to the normally kind and Christian people that dominate evangelical ranks), I'd like to suggest they get their own house - and homes - in order before they start (falsely) criticizing Mormons for divorce and other social ills! On a related note, I have a post on dealing with mental illness in the Church on one of my favorite blogs, Times and Season, an LDS blog. My post offers some advice to Church leaders about dealing with the complex issue of mental illness in some Latter-day Saints, something that we need to better understand and be more prepared to deal with in order to help most effectively. A Brigham Young University sociologist says data from national surveys show Mormon women are less likely to be depressed than American women in general and show no major differences in overall life satisfaction compared to women nationwide but do score lower on measures of self-esteem. . . .
Johnson's conclusions upheld findings of some earlier studies that Mormons have no more depression than does the nation's population as a whole. Others have concluded, largely based on above-average anti-depressant consumption or on conflicting suicide statistics, that Mormons must have more depression. Traditional women's roles involved with marriage and homemaking have long been cited as part of the reason for the purported depression, but national women were three to four times as dissatisfied with their work as Mormon women, Johnson said. . . .
Other studies have found less depression among people with above-average church attendance, and have suggested that it may derive from the support they get from others in their churches. In terms of life satisfaction, including place of residence, work, friendship, health, family life and financial situation, there were no statistically significant differences in response, she said. Almost twice as many Mormon women answered they were "very happy" compared to others, she said, with three times as many national women reporting they were "unhappy." More of the Mormon women were married at the time of the survey than those nationally, and the latter group had experienced divorce at a rate four times higher than their Mormon counterparts, she said. In measuring self-esteem, Mormon women scored roughly 10% below their national counterparts in rating their ability to "do things as well as other people." She said the findings "could be a reflection of the higher standards that are espoused" by The Church of Jesus Christ of Latter-day Saints. Some researchers contend that measures used in self-esteem research are biased against orthodox respondents because their language is contrary to religious ideals like humility. 2008 Update: Another useful resources on the suicide issue is the FAIR Wiki page on the Utah suicide rate and the suicide rate among Mormons. Some further information from recent studies is available at "Academic Articles about Suicide Rate among Latter-day Saints (Mormons)" at Adherents.com. This includes evidence published in the American Journal of Epidemiology that active Latter-day Saints are less likely to commit suicide than their less active or non-LDS peers. Worth thinking about! While it's possible that aspects of Mormonism are causing or compounding depression, there are plenty of alternate explanations for why Utah (which is not actually all Mormon, but let's ignore that for a moment) might have a high medication rate. One possibility is that Utah actually does have high depression rates--but because of another factor such as weather or high levels of some recessive Scandinavian depression-related gene. But since medication rates are not the same as depression rates, it's also possible that Utahns are not actually more depressed than any one else, only better medicated. It's possible, for example, that because of Mormon influence, Utahns are more likely to go to doctors for medication than to self-medicate through substance abuse. Or else that Mormons are more likely to find voices that decrease the stigma of mental health treatment, either in official church publications or just through brothers and sisters who are informed about or experienced in dealing with medical depression. Steve goes on to point out that critics who stigmatize the use of medication in dealing with mental health issues actually contribute to a serious problem. Millions of people in need of help with mental health issues aren't seeking treatment because of society's stigma against mental health problems and mental health treatment. Mormons, on the other hand, may be much more progressive in providing support and encouragement. People struggling with depression are, in my opinion, are more likely to find help and referrals to professional services by discussing their challenges with a bishop or with circles of support in the Church. There are sad exceptions and sadly members who are ignorant or judgmental can sometimes make the church way too stressful of a place for those with serious mental health issues. But the policies, systems, training, services, and intentions of the Church are strongly in favor of providing help without stigma to those sufferiing from depression or other mental health issues, and referrals to professionals for medication or other help are likely to be given, in my opinion, when active members face health problems of any kind. Higher meds in Utah, therefore, aren't necessarily a sign of the Church making life worse for people. It might be an indicator that the Church is working actively and effectively to make life better for those with mental health challenges. Some criticize the church for its investment, judging that the funds could have been better spent elsewhere. (The total estimated cost of the project is $1.5 billion; it is not known how this was shared between the church and its development partner, The Taubman Company.) These criticisms ignore the merits of the Church's strategy--the City Creek Center addresses the roots of urban decay, and the Inner City Project addresses its symptoms. There are many places in the world with greater need--and the Church's humanitarian programs commit significant resources to them -- but the Church shouldn't be condemned for helping its own neighbors in the city to which it has special historical ties. Yes, I can understand why people would be concerned at the outer appearance of the story when spun as "Mormon Church Builds Mall." On the other hand, it's not hard to imagine an alternate universe in which the Church refused to spend any money to upgrade the local community of Salt Lake City, and in the midst of the ensuing urban decay, was denounced by the same critics for neglecting it's own neighborhood around LDS Headquarters. The real issue here is not whether a mall is evil or good, but whether Starbucks there will offer enhanced alternatives for strict Mormons. Why does coffee come in a zillion flavors, and yet for hot chocolate we get one choice made from a cheap powder? Please, Zion needs more than nice, safe neighborhoods. It needs better hot chocolate beverages. Ed Decker, the main anti-Mormon behind that work, is an excommunicated Mormon with an ax to grind. Surely he knows that his claims against the Church are lies. Mormons taking over the world? Satanic rituals? It's a movie designed to spook people while mocking in the crudest way the sacred beliefs of others. The National Conference of Christians and Jews has condemned "The God Makers" for its misleading depictions of our faith (see their comments on Russ Anderson's page of "God Maker's" reviews). In fact, even other professional anti-Mormons have openly criticized his work for its blatant dishonesty. For those needing a point-by-point rebuttal of Decker's book of the same title, see Gilbert Scharff, The Truth About "The God Makers" (Publishers Press, Salt Lake City, Utah, 1986). "My Dentist takes off three days, Friday, Saturday and Sunday and I had thought it was because of him being Mormon. Is there a Sabbath of sorts in your religion??" Dentists and bankers seem to have different religious practices than the rest of us. The normal LDS Sabbath day is Sunday. We avoid work on that day and try to make it a family time, a time of service, a time of learning and worship and doing good. Dentists and bankers extend the Sabbath back to Friday and spend the extra time communing with deity through golf (well, at least they pray after every swing). I read an anti-Mormon Web page that said Mormons pray after each touchdown BYU makes. Is that true?? Of course not! We pray BEFORE the touchdown. As our scriptures say, faith precedes the miracle. The minute grain of truth behind this silly attack is that BYU fans can take football way too seriously. I was at BYU in 1984 when they won the national championship. Those were dark days for academics - all people talked about was football, football, football. I thought I was escaping such foolishness when I moved to Wisconsin. But then came the Green Bay Packers and the Superbowl. Sadly, they won. For six weeks our local paper reported almost nothing but Packer trivia. China could have invaded and conquered Washington, D.C. and no one here would have noticed. (In fact, they may have done so after all!) Then I yearned for the relative sanity of BYU. Well, I've got to run. The Braves are losing game 4 of the World Series - and unless I get busy, it looks like they haven't got a prayer. No, I don't belong to any cult that hates Mormons. But there are a lot of Mormon hate cult members publishing anti-Mormon hate literature as books, pamphlets, Web pages, films, and radio shows. Don't let those cults brainwash you! One of the interesting differences between The Church of Jesus Christ of Latter-day Saints and some other allegedly religious organizations and individuals is the way other faiths are dealt with. While we disagree on a number of doctrines, we do not have ministries aimed at tearing down Catholics, Baptists, Methodists, etc. The Church does not produce films aimed at slamming Catholics or Jews or Buddhists. We will never issue an official proclamation declaring that Methodists aren't Christians. We do not have talks in our meetings on topics like "10 Reasons Baptists are not Christian" or "Reaching Out to those Lost, Vile, Pagan Presbyterians in Love." We do not make movies like "Lutherans: Satan's Cronies." We respect other faiths, in spite of our differences, and focus on proclaiming our message, not attacking their members and leaders. Depends on what you mean by "proved." If the movie "King Kong" proves to you that giant monkeys are a serious threat to the Empire State Building (Homeland Security, please take note), then I suppose Will Bagley's new book, Blood of the Prophets may indeed "prove" his allegations against Brigham Young. But if by "prove" you mean something more than mere accusations coupled with deceptive special effects (e.g., fabricating evidence), then I don't think Will Bagley's book rises to the challenge. For details, see Robert D. Crockett, "A Trial Lawyer Reviews Will Bagley's Blood of the Prophets," FARMS Review of Books, Vol. 15, No. 2, 2003, pp. 199-254. Bagley's research is extensive and takes advantage of sources not known to Juanita Brooks. His handling of those sources, however, is problematic and at times is manipulated to fit his thesis, and both his prejudices and biases quickly become apparent. Bagley is intent upon implicating Brigham Young in the massacre. To do so, he repaints nineteenth-century Utah with blood. . . .
We believe that all truth will be self-consistent. Truth is what we are after, and that means that we want to find answers to many questions. Some we don't have yet, of course, but we seek for truth - and that means seeking for answers. In fact, this tendency to seek for answers which you see as cultlike is, in fact, an indirect evidences that the Church really is a restoration of the original Biblical Church, for the early-day Saints, like latter-day Saints, were taught to be "ready always to give an answer to every man" concerning questions of faith (1 Peter 3:15). Don't mistake active learning with "cult" behavior. Good grief, we don't come close to the Lord's expectations to know His word. The ancient Jews spent a lot of time studying and memorizing, and early Christians sought diligently to study the word and have an answer for every question. We should be doing that more! God does very few things the way I would, from the design of trees to the color of the sky, and especially the lifespan of certain individuals (let's leave politics out of this). When He chooses the lifespans (or allows others to choose them) of those in particular armies, cities, or population groups, it's rarely according to my will. But I'm getting used to it. I have to remind myself that I am not the Creator, do not know everything, do not understand His eternal purposes, and can't even change the oil in my own car. With that in mind, I don't think I have any right to second guess and nitpick His decisions. If Mormons oppose gambling, why does the Church own most of Las Vegas? Gambling money is the only way you could pay for all those temples. Thanks for the note. Las Vegas owned by the Mormons? I'll give you ten-to-one odds that this rumor was invented by someone after a few too many drinks. The Church has a lot of members in Nevada and Las Vegas, and a Temple there, a number of Churches and probably a cannery and other welfare buildings, but the Church surely does not own most of Las Vegas or any of the gambling businesses. The Church stridently opposes gambling. I have been part of the efforts of the Church to oppose gambling and legislation that would legalize gambling. Note that gambling is not legal in Utah, for example. Tithing is the primary source of revenue for the Church, donated by members, and is the source of funds for temples and other buildings. The Church certainly does not raise money through gambling! What is the reference for the alleged BBC story about the Church and Las Vegas? The BBC can say anything it wants, but the BBC is far from infallible. But I would be most surprised if they really said what your friend thinks they said. That's a great definition of cult. We've got to watch out for such groups! In fact, I pray that you are not part of the dreaded Christian cult. From its earliest days right up to the modern, Christianity has been generally considered to be false (ask any ancient Roman, any Buddhist, any atheist or animist). Its deceived adherents, of course, engage in all sorts of unconventional practices, such as symbolic cannibalistic rites with bread and wine, refusing to work one day a week, payment of tithes or offerings to a church, getting on knees to chant prayers to an invisible God, teaching children that God created the earth in 7 days, and sometimes even suffering death rather than acknowledge officially sanctioned truths from the State. Such extremism is no surprise when we consider that Christianity traces its cultic roots to a highly charismatic, authoritarian leader named Jesus Christ, who encouraged his followers to be prepared to give up all that they had, even their lives, rather than yield to other ways of thinking and living. He died under Roman torture, refusing to give up His Messianic mission, an extremist to the end. Heaven help those who follow such a Leader! I trust you are also not a member of another related cult (arguably outside the scope of authentic Christian cults) which places its trust not directly in God but in a man-made object alleged to contain ALL the words of God. Members of this cult worship a book called the Bible, believing that they can put all trust in their human translations of multiple competing versions of copies of ancient texts (no originals are left to check which copies are best!). They believe that this book, in spite of the undeniable textual problems and uncertainties, is the complete, inerrant and infallible Word of God, though this statement of faith is NOT found in their supposedly complete book, nor is the statement of faith that God cannot give any more scripture. It is a closed system immune to debate, relying on blind faith in their authoritarian system which results in a variety of extreme, unconventional positions and behaviors generally considered to be false by those outside their circle of faith. Do Mormon temple practices resemble Wiccan rites? Aren't temples occult centers? In the pagan community during the 1980s, some of the founders of Wiccan religion (e.g., Barney Taylor of the Mental Science Institute) created teachings and rites by borrowing elements from Rosicrucianism, herbalogy, Latter-day Saint religion (esp. the temple), and the occult. Thus, there are some elements of LDS religion that have most inappropriately been adapted by pagans, just as pagans have adapted elements of Judaism and Christianity for centuries. But these common elements are not because the LDS temple has an occult origin. The occult folks borrowed from us, not the other way around! Latter-day Saint temples are uplifting, Christ-centered places, houses of God and refuges from the impurity of the world. Just as the temple was important to ancient Jews and early Christians (see Acts 2:46, Acts 5:42, Matt. 21:12-14, Luke 24:53, Matt. 23:21), so it is important in the restored Church of Jesus Christ. In fact, it was prophesied that the temple of the Lord would be an important part of the Lord's work in the "last days" before the Second Coming of the Lord and afterwards in the great Millennium (see Isaiah 2:2-4, Revelation 7:15, Malachi 3:1-3, and Ezek. 37:26-27). Come to think of it, if you're looking for a church with the fullness of the Gospel, seems like you ought to look for one that includes temple worship. For more information on the issue of temples and their nature, see my page dealing with common allegations about LDS temples and Masonry. If the evidence for the Book of Mormon means that the unschooled farm boy Joseph Smith could not have written it, why couldn't demons have inspired him to write it? If testifying of Christ and bringing people to faith in Christ is a demonic goal, then Matthew, Mark, Luke and John may also have been demonically inspired as well. No wonder their words are so consistent! Sometimes critics actually do look into the impressive evidence for the ancient authenticity of the Book of Mormon, evidence which shows that Joseph could not have fabricated the Book of Mormon based on what he could have known in 1830. Some ignore the evidence or pick at it, but others, still bent on attacking with Saul-like determination, conclude that Joseph could not have fabricated it by natural means - so the devil must have done it. But this argument can only be advanced in stark ignorance of what the Book of Mormon actually teaches. The Book of Mormon confirms the truth of the Bible. It is the most Christ-centered book you'll ever read. It urges people to have faith in Christ, to repent of their sins, to follow Christ, to be humble, morally clean, and prayerful. No one can read that book for more than a few pages without realizing that this book is intended to bring souls to Christ -the SAME Christ that is taught in the Bible. Getting people to follow the Savior is not one of Satan's goals. 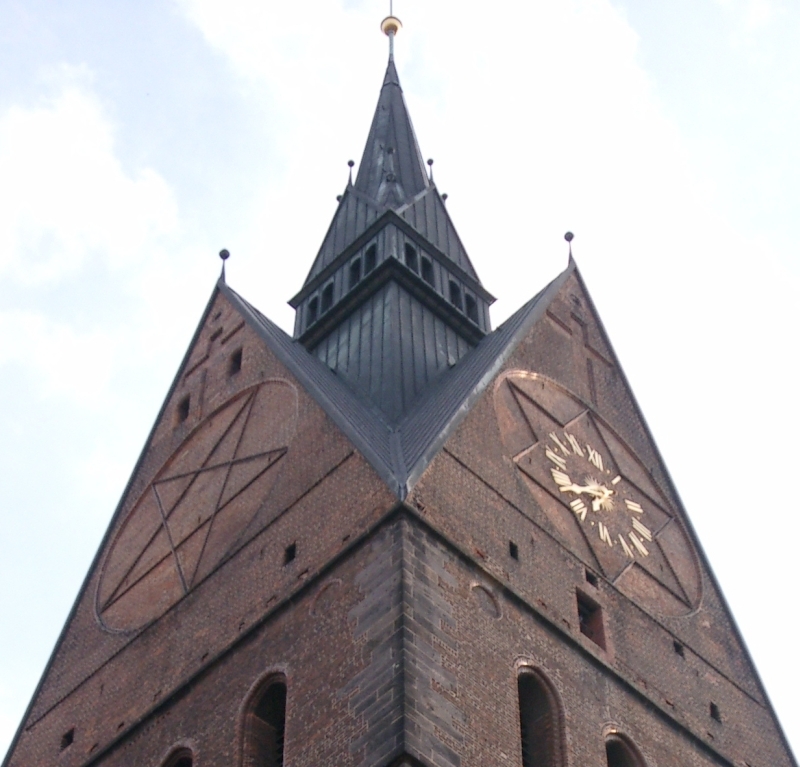 Some examples of the inverted pentagram as a Christian symbol in mainstream Christian traditions can be found in several Church photographs at LDSFriend.com. 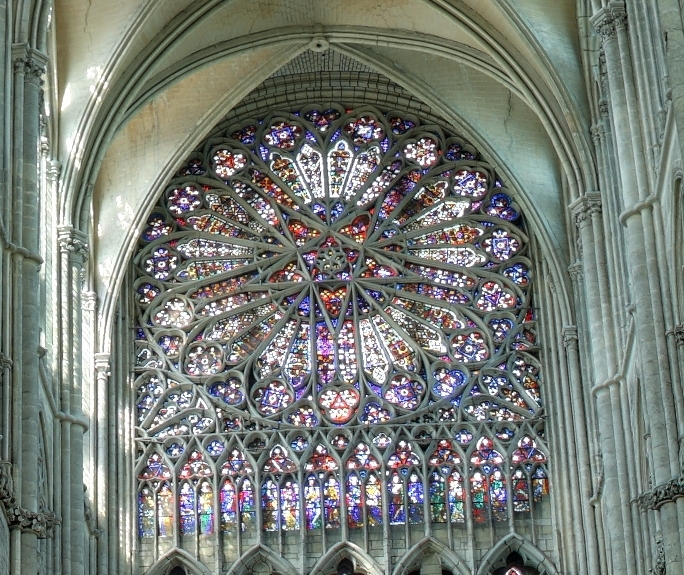 They are listed in the comments on a page at TempleStudy.com on the pentagram, including photos for the Amiens cathedral in France and the Hannover Marktkirche in Germany. I found one myself while visiting a 17th-century church in Vitry-le-Francois in France. Another helpful resource discussing starts (and also the issue of the name Lucifer for Satan and his connection to stars) is found in the story of René A. Krywult's Conversion from Catholicism to the Latter-day Saints. I strongly object to your allegation that silence on my part implies agreement with your charges. On the Internet, it is a courtesy to receive any response at all to unsolicited e-mail. I am swamped by e-mail and don't have time to answer every item received. Silence cannot be taken to mean anything at all. Even if I took the time to respond to everything, there are plenty of reasons why you might think I'm being silent. In many cases, e-mail never gets to the targeted recipient (me) due to server problems or accidental deletion. Sometimes, it gets read and a response is sent but is not received. There are other messages that I wish to respond to, but require time to look up a reference or contemplate an appropriate response, and sometimes these messages get put on the back burner and languish for weeks or months, only to have the e-mail address of the original sender be changed in the meantime. There are many reasons why some people don't get immediate answers from me, and so far they have nothing to with their attacks on the Church being so convincing that I am forced to consent through silence. With a little luck, you'll get this message - but there's a significant chance you never will, in spite of my best efforts to send it to you. Did you notice this quote in the recent New Yorker magazine article on Mormonism? I think it about says it all. "Many Mormon intellectuals seem unconcerned with the question of whether Joseph Smith was a genuine prophet or a confidence man. 'The starting point is that I am a committed Mormon,' Ken Driggs, a Mormon historian and a lawyer in Atlanta, told me. 'I can't imagine anything else. Once you make that decision, nothing knocks you awry. I am aware of the conflicts; I know the Book of Mormon doesn't stand up to historical examination. But for me to decide that the problems are insurmountable would mean walking away from five generations of people before me. What really clicks, what really keeps us there, is the culture.'" Says it all for who? The reality and truthfulness of the Gospel and of The Book of Mormon: Another Testament of Jesus Christ is precisely what keeps people in the Church and keeps them willing to make the sacrifices that true Christianity demands. People like Mr. Driggs strike me as oddities. I think there is nothing in "LDS culture" to hold people in its ranks in areas where the Church is a complete and misunderstood minority, as it is in Atlanta. I can almost understand a "cultural non-believing Mormon" in Utah, where the Church can expand one's social circles substantially, but it still doesn't make sense. If Joseph Smith wasn't for real, why should the foolishness of an ancestor make my decision in my personal quest for truth? That's certainly not why I have chosen to be a member of the restored Church of Jesus Christ. That's not why I have two years of my life to serve on a mission. That's not why I make many other sacrifices - joyous sacrifices - for the cause of Christ. When I think of culture, I think of bacteria or perhaps yogurt, not reasons to be a Latter-day Saint. Mr. Driggs' statement on the Book of Mormon suggests that he is seriously out of touch with the Church and LDS scholarship - if he really gave this quote. The Book of Mormon withstands the most intense scrutiny its critics have been able to muster (see my Book of Mormon Evidences page, for example). The few "cultural Mormons" that I know of are people who made up their minds early that God doesn't exist or whatever, without being open to the evidence of Book of Mormon authenticity. That's a pretty shallow approach. And to stay in when you don't believe it is just silly. Is tradition what holds people in the Church? No way. The majority of Latter-day Saints live outside the United States and are new converts themselves or in the family of a first-generation Mormon. The fifth-generation Mormon is quite unusual. My current congregation - the Fox Cities Hmong Branch of Appleton, Wisconsin - is almost entirely composed of recent converts and their children. The Branch President has been a member for 11 years, but most are far more recent than that. And they have all faced significant persecution for leaving their former culture to become Christians. It wasn't our allegedly great social life that inspired them to do that. Now there's an optimistic view of the future. I know it's not what you meant, but that view can be taken to extremes. After all, if it's all going to burn, we can not only abandon record keeping, but lawn care, car washes, and mopping. And why save money or the environment or anything else for the future? But who says the Second Coming will burn everything? And who says that God can't preserve sacred written records (as journals can be, IMHO) even if some places do get a little toasty? Records will be precious in the future, and even in the near future (like during your lifetime). Frankly, the Second Coming could be a century or two away. By then, everyone will have fireproof vaults and non-charring paper. No need to worry. The scriptures teach that many people will live through the Second Coming. People are even more sensitive to temperature than journals, so the odds of some journals making it are reasonably good. But use high-quality paper and black ink, which is longer-lasting than blue. If you really want your records to last, engrave them on metal plates and bury them in a stone box. Hey, it worked for Mormon and Moroni! And it worked for the authors of other ancient records discovered since Joseph Smith's day, a day when the idea of writing on metal plates was too funny for words, as Hugh Nibley puts it, making the recent recognition of the authentic ancient practice of writing sacred records on metal one of the many subtle evidences for the authenticity of the Book of Mormon. But I digress. Bottom line: get out your journal and write. I need to do some now myself. Good night! I'm not saying that God uses time travel, but the scriptures say that all things are "present" before His eyes (Doctrine and Covenants 38:2, Moses 1:6), and he truly knows things that are past, present, and future (1 Nephi 9:6, Mosiah 8:17). In fact, the place where God dwells is described as a place where all things, past, present, and future, can be seen (Doctrine and Covenants 130:7). But God's power to see what we do with our free agency does not remove our agency or accountability, just like the thief who is caught in the act by a hidden camera is still responsible for his crime (though I could imagine some US judges letting criminals go for having been videotaped without their consent). To my understanding, The Church of Jesus Christ of Latter day Saints believes that God knows for certain all future things but man has free will (according to D&C 38:1,2 and a book that I think was written by James Talmage . . .) but Abraham 3:25 says, "And We will prove them herewith, to SEE IF they WILL DO ALL THINGS whatsoever the Lord their God SHALL COMMAND THEM. "This scripture seems to show that Jesus didn't know if man was going to do all things that God commanded him to do and that it was possible he wouldn't. Can you imagine if God just took us as spirits in the premortal existence and said, "If you were born, you'd be evil, so I'm sending you to hell now?" That would be monstrous. We are given free agency and sent here to see what we will choose. Without the process to let all of us act and see what we will choose, there is no justice in punishing or rewarding us for things we might have done. But there is more than just seeing what we choose - God's end product requires the process, not just the "yes or no" answer. The process of being born and going through mortality - however briefly - can help us become what He wants us to become: maturing sons and daughters who choose Him and become more like Him. The "seeing" is an unfolding of our identities that, at least for many of us, can't be achieved just by throwing selected spirits into heaven or hell, based on God's perfect foreknowledge. From my understanding of the scriptures and physics, I suspect that time as we know it is putty in God's hands. All things, past and present and future, are present before him (D&C 38:2). If he can transcend time and see the past and future, then I suppose that He can truly know what is yet future to us in a way beyond merely great forecasting. But does such knowledge take away our agency? What are you going to choose to do today? If I hide a camera in your house and observe your choices (don't worry - I don't work for Homeland Security and am not that kind of person! ), does that take away your agency? No - the presence of an observer (divine or federal) does not remove your freedom to choose. Now if the observer is watching through a camera via some sort of a time machine, so the image is being sent not just to a different place, but a different time? The presence of that camera does nothing to change your responsibility for what you do, good or bad - you don't become a slave to God's arbitrary will (or the will of the present Administration) just because you were observed - whenever that occurred. We are free to choose, even if God has ways of knowing or seeing our choices. Does he choose to observe all our choices ahead of time? I don't know. Can he? I think so - but in any case, I know that I am free to choose, and am grateful for my agency. I know a lady who stared into the sun and said she saw God. Lots of lunatics claim they see angels. What makes Joseph Smith's claims any more believable? None of the witnesses who also saw angels with Joseph Smith ever denied the reality of those divine experiences. Can one say too much about the reality of honest and respected witnesses who saw the gold plates and even saw angels of God? God does indeed call multiple witnesses to testify of those things that are most important. And of course, many decades after the Restoration, we are still left with the tangible yet miraculous witness of Christ in the form of the Book of Mormon, for which we can obtain our own witness through the Spirit that it is of God. Biased? Me? ABSOLUTELY! I am not an agnostic blindly speculating on the pros and cons of the existence of God. I know God exists. The evidence and the facts have put me squarely on one very biased side of the debate. And I will boldly proclaim that He lives and is real, with no shame at all in taking such a biased stance. Further, I know that His Son, Jesus Christ, is real and is our Savior. And I know that His Church is upon the earth, led by Him as He led it before, through revelation to authorized prophets and apostles who have authority from Him. And I know that the Book of Mormon is no work of fiction by some farmboy, but a genuine, authentic scriptural record from an ancient people, and I know that is a true testament of Christ. Knowledge of these truths makes me biased. But that's the price one pays for seeking and finding truth. I hope you're biased about many things as well. For example, I hope you are biased about the dental benefits of flossing and brushing. And if you ever do a Web page on the topic, please don't try to be even-handed in your discussion, but come out and defend good dental hygiene. No need to repeat the garbage of the anti-hygiene crowd. No need to give credence to spurious works like Behind the Mask of Dental Hygiene or No Man Knows my Dentist. Don't provide links to the whiners in the "Ex-flossers for Justice" gang. Be bold in defending the truth about teeth! Teach it to the world. Be a dental hygiene apologist. When it comes to saving people's teeth, there's no justification for an unbiased approach. We need biased defenders of the truth, who use the abundant facts and logic and evidence to honestly and truthfully teach every person the reasons to take dental hygiene seriously. This was actually the topic of a recent debate on a public bulletin board featuring Mormons and critics. I was surprised and even flattered that my little Web site was enough a concern to some anti-Mormons that they have taken up name calling to deal with me. But are all my answers really so predictable, as some of my critics have publicly proclaimed? Well, if they mean that I'm not presently planning to roll over and leave the Church in response to their attacks, or that I'm going to try to find answers to the questions that are asked, then yes, slap that "predictable" label on my forehead. But what about the content of my responses, which I feel that the critics tend to ignore? I think some of the answers have been quite hard to predict. Take, for example, the issue of parallelism in the Book of Mormon. One critic, David Wright, has alleged that the alleged internal evidence of authenticity found in 2 Nephi 12:16 is actually a clumsy blunder on Joseph Smith's part, claiming that Joseph may have added a phrase to a quotation from Isaiah to make it look like an impressive ancient variant. It's a complex issue, discussed on my page "2 Nephi 12 and the Septuagint: Evidence for Fraud or Authenticity in the Book of Mormon?" A major part of Wright's argument is that the added text in 2 Nephi 12:16 destroys the parallel structure in Isaiah 2, which has a series of couplets (paired bicola), in contrast to the triplet (tricolon) that appears in the Book of Mormon. So what is the predictable answer? I couldn't have told you until I dug into the issue. I found that Hebrew scholars recognize that tricola as well as bicola appear in Isaiah and other Hebrew poetry, and in fact, that a tricolon can appear in the midst of bicola in Isaiah, Jeremiah, and other books of the Bible. Thus, the Book of Mormon variant in 2 Nephi 12:16 is actually entirely plausible. Is it entirely predictable that apparent problems in the Book of Mormon become plausible once further research is done? Well, shucks, I guess it is. Lord knows it just keeps on happening. But could even the most prescient or clairvoyant critic predict what I found next? You see, in learning more about Hebrew parallelism to investigate David Wright's claim, I read non-LDS scholars who wrote about a recently discovered, sophisticated form of parallelism called the "paired tricolon," a poetical form found in Isaiah and Jeremiah. I then wondered if Nephi, who was deeply familiar with Isaiah and Jewish poetry of that era, might have used paired tricola as well. Though my analysis remains preliminary, I quickly found several apparently solid examples of what appear to be genuine paired tricola, a form that appears to be absent later in the Book of Mormon. I have called this to the attention of many critics, who have remained silent about the issue (though some have finally responded with a little name calling, which is the predictable and welcome upgrade from mere silence). So, in my response to a general objection about tricola in an Isaiah passage in the Book of Mormon, I found that not only are tricola known to be used in the midst of bicola, but that paired tricola are also known as an authentic ancient Hebrew poetical form, and that these are found in the Book of Mormon as well - predictably, only by the writer who was closest to the Hebrew poetry of Isaiah. Is that response predictable? Is the finding of paired tricola in the Book of Mormon the kind of thing one would simply expect from a crackpot brainwashed Mormon apologist? If it's predictable that solid evidence supporting the authenticity of the Book of Mormon will be found as we learn more, then I would suggest - or even predict - that Book of Mormon critics will continue to fight a losing battle. Some of my answers reflect well known LDS views and repeat answers that we've been giving for a long time - and I guess that makes the responses predictable - but it would be nice if the critics would acknowledge that responses have been made instead of commonly pretending that their objections remain unanswered by an ostrich-like Church. But other answers are based on investigation that took me to surprising places, such as my digging into the issue of DNA and the Book of Mormon, the alleged problem of the wordiness of the Book of Mormon, the challenge about mercy and justice in the Book of Mormon, or my exploration of the issue of plagiarism, culminating in my quite unpredictable page, "Was the Book of Mormon Plagiarized from Walt Whitman's Leaves of Grass?." Mark this prediction: the evidence will continue to take us to surprising new insights about the Book of Mormon, all of which will continues to support its authenticity and divinity, though some of our dated assumptions about the text may require updating. Hmmm, exactly the kind of question an evil anti-Mormon villain would ask! Why are you always persecuting us this way? Ok, yes, Latter-day Saints sometimes use the term "anti-Mormon" too loosely and too defensively. However, the term generally refers to people who do more than just disagree, but go out of their way to tear down the Church in a way that goes far beyond civil discourse. A malicious, "end-justifies-the-means" approach that consistently and deliberately misrepresents LDS views is a hallmark of the true "anti-Mormon." Sometimes they are motivated by profit, making good livings off of selling hateful literature. Others are more sincere in their efforts to tear the Church down at all costs. In general, anti-Mormons deliberately distort doctrines and events to make them sound as ghastly as possible. The goal is to inflame, not inform. Some critics really are just trying to share their views in a civil, honest matter, and should not be called anti-Mormons. What is it about Mormonism that accounts for such an enduring and tenacious fixation on this marginalized and relatively minor denomination as one of the most significant threats to presidents, Christianity, and good airlines that America has ever known? The history of religious and ethnic prejudice in American culture is vast indeed, and perhaps this is but another monotonous example of the more pernicious aspects of the Jacksonian inheritance. But there are grounds for believing otherwise. The history of anti-Mormonism has much to distinguish it, both in the intensity and variety of its manifestations and in the uniqueness of its object. In no other case in American history has a governor signed an order for the expulsion or extermination of a segment of his state's own citizenry (Governor Lilburn Boggs of Missouri in 1838), a state militia forced the evacuation of a city of thousands (Nauvoo, Illinois, in 1847), the United States sent an occupying army against its own citizens ("Buchanan's blunder," 1857-58) or dissolved a church as a legal corporation and disenfranchised thousands of its members (Edmunds-Tucker Act, 1887). From its founding in 1830 to the turn of the century, Mormonism was the subject of persecutions, mobbings, state extermination orders, editorials, religious pamphleteering, congressional committee hearings, federal legislation, and several national political platforms. Many accounts of the "Mormon Problem" in American history have been written and the sources and shape of the Mormon conflict explored. Several of these interpretive histories seek to answer the question the Mormon experience recurrently invites: Why an influence and reaction out of all proportion to the religion's relatively small numbers? Some have seen Mormonism as merely one of several new and unorthodox American religious and quasi-religious groups that sprang to life in the 1800s. Spiritualism, Christian Science, Mesmerism, Utopianism, to name a few, also gained large followings to their unconventional value systems and teachings. Some of them engendered hostility and opprobrium. None elicited pogroms, disincorporation, and disfranchisement. There has been a difference in the way Mormons have been treated in the past. There has been genuine persecution, though we are grateful in these days that overt violence against us has generally ceased. We are grateful for this time of increased understanding and civility, and hope that it will last. But rhetoric against Latter-day Saints has hardly died down, and real anti-Mormons - often professional ones - work hard to stir up anger. I urge all of us to resist such religious bigotry. It is not inspired of God. Remarkably, modern anti-Mormon tactics are quite similar to those of ancient anti-Christians such as the influential Roman named Celsus. I recommend the essay, "Celsus And Modern Anti-Mormonism" by Aaron Christensen, available at the FairMormon.org site. Some things never change - especially when they have the same source of inspiration. I don't know, but with the advances in GPS technology, they won't be lost much longer. Already some candidates have been proposed. America's public TV service, PBS, had a program called "Where are the Ten Lost Tribes?." The link is for Part 1. Also see Part 2 and especially Part 3, which mentions an interesting group in Chang-Min, China. A little more information about the "Chang-Min Jews" is on Mosiach.com and many interesting and personal details are at israelitishworldwide.blogspot.com. Go to Part One of Answers to Facetious Questions.